Part 1: Could Nuclear War Start By Accident? 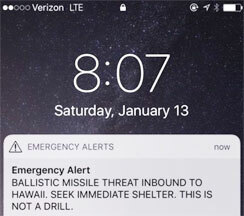 Saturday morning, January 13, 2018 - Original ballistic nuclear missile alert to Hawaiian Islands that caused panic for 38 minutes until authorities announced false alarm due to human error. Then 3 days later, the same thing happened in Japan. During the next 38 minutes, parents even tried to put young children down storm drains in the street.